Specializing in Industrial and Municipal liquid waste hauling and disposal. 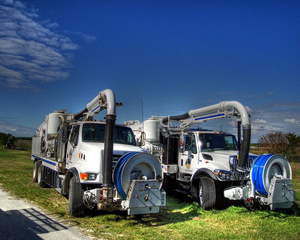 Headquartered in Gulfport, Mississippi, since 1988, Vacuum Services Group is an established Vacuum Truck Services firm specializing in services to municipal, industrial and commercial customers. Our fleet of professionally maintained vehicles are always operated by well trained, experienced drivers and technicians. Our vehicles are configured to haul and dispose of virtually all wastewater liquids. We identify drainage problems by providing color video inspection of pipes from 6 inches to 120 inches. We offer FREE Waste Cooking Oil Services, that includes the containers. All services are provided by duly licensed and insured registered technicians meeting all state and local requirements. 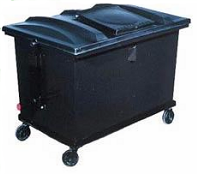 Customers will receive free containers (such as the one pictured above), equipment and the area will be kept clean, and a manifest and supporting documentation will be provided for all product picked up. In addition to providing a manifest, we keep all related pickup and recovery paperwork on file ready to provide for state or local audit. Vacuum Services Group can clean any line, regardless of size or type. We utilize high velocity jetting and varied techniques for line cleaning. 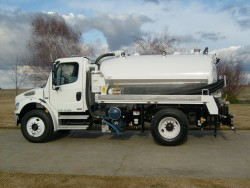 Our vacuum trucks are designed for cleanup and removal of all liquid or semi liquid waste. This includes liquids from grease traps, basins, lift stations, commercial or residential septage tanks, spills and bulk liquids. Established in 1988, we offer vacuum truck services 24 hours a day, 7 days per week. Our firm is lead by a management team with over 25 years of service and experience. Our employees are trained, professional, Department of Transportation qualified drivers and operators. Phone: (228) 865 - 4747 "Option #2"